Editor’s note: Charter Enrollment in my colleague Jon Markman’s phenomenal options trading service closes tomorrow. When that happens, the $2,105 discount Jon has arranged for you will expire. Go here for all the details, and see how he’s helped his readers average 99% yearly returns. For over a year now, we’ve seen grim faces around the table at OPEC. The oil sheiks keep cutting production to support prices. But as much as they cut, U.S. producers pump even more. It seemed like OPEC was a victim of its own success. Until an unlikely candidate stepped forward to self-immolate and save OPEC’s bacon. Ladies and gentlemen, I’m talking about Venezuela. 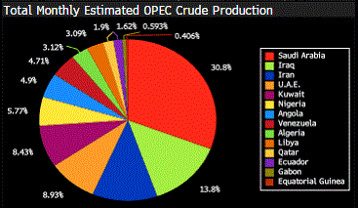 It is a major OPEC producer, and it is sliding into a black hole of chaos. And this is bullish for oil prices, and for select U.S. energy stocks. So, what do I mean when I say that Venezuela is sliding into chaos? I mean that its government is nearly non-functional. Citizens are starving or fleeing over the border. The country can’t pay its debts. There are many reasons for this. Start with the fact that Venezuela is a socialist hell-hole. It’s actually much more complicated than that. But whatever the reasons, it’s not fixed easily. Wow! The latest OPEC figures put Venezuela’s oil production at 1.52 million barrels per day (bpd). That’s down from 2.4 million bpd recently, and way, way down from 3.3 million bpd in 2001. So how does this help OPEC? 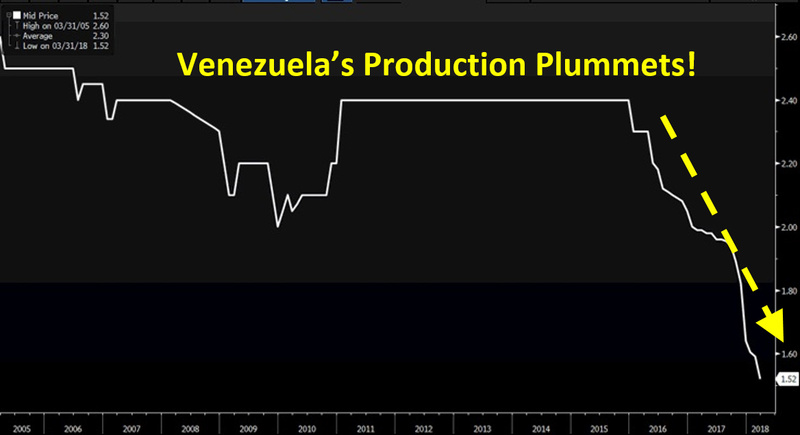 Well, Venezuela’s oil production has fallen so far, so fast, that it’s exceeding the big cuts that Saudi Arabia agreed to in the cartel’s 2016 agreement limiting output. OPEC is addicted to selling oil — they can’t live without it. But they need high enough prices to pay for all their goodies. This means they often cheat on agreements. This time around, Saudi Arabia, with help from Russia, made those production agreements stick. 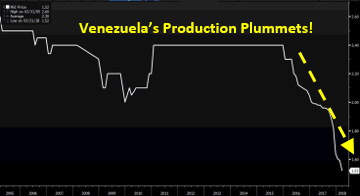 But it wasn’t enough — until Venezuela’s production fell off a cliff. This should be embarrassing for Venezuela. After all, it has the biggest oil reserves on Earth. 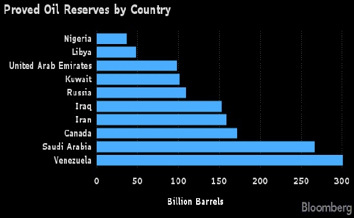 But a lot of those reserves are very heavy crude oil. To export that heavy crude, Venezuela must cut it with lighter oil. But with Venezuela’s economy in shambles, it’s harder and harder for that country to import light oil. This means even LESS exports of Venezuelan oil. And that means the financial crisis spirals deeper and deeper. I don’t know if Venezuela has a way out. It may get a new government that can work out a deal with foreign creditors and get the U.S. to lift economic sanctions. Or, Venezuela may plunge into a black hole of economic collapse. In that case, its entire oil exports are threatened. And despite its recent fall, it still accounts for 4.7% of OPEC’s total supply. At last count, OPEC still exported 32 million barrels per day. If 1.5 million bpd of that suddenly disappeared, well … prices are made on the margins. You’d see oil prices go much higher before finding their next level of equilibrium. OPEC will likely cry crocodile tears if Venezuela’s production is cut off. Because that boost in oil prices will save the bacon of high-living oil sheiks who want top dollar for every barrel of oil they sell. One loser in this might be Valero (NYSE: VLO). It imports more than 200,000 barrels per day of Venezuelan oil for its refineries. But if it can source that from elsewhere, it will do okay. Potential winners are select U.S. oil producers, as well as drillers. Both are doing well … and should do even better if oil prices climb higher. You can find plenty of good candidates in the SPDR S&P Oil & Gas Exploration & Production ETF (NYSE: XOP) and the SPDR S&P Oil & Gas Equipment & Services ETF (NYSE: XES). Sure, this market will zig and zag. You shouldn’t chase anything. But after the next drop should come an even bigger pop. Be ready for that. And if you’re looking to take some calculated risks to go for big gains as the market zigs and zags, my colleague Jon Markman is one of the best options traders I know. He’s averaged 99% yearly returns for his readers since 2012. Enrollment in his Markman’s Strategic Options service is open right now, but closes tomorrow. Go here for all the details and save $2,105 on your membership. I would not bet against a heavy-oil giant like Valero on the Venezuelan collapse. To begin with there’s plenty of heavy oil coming from the Alberta tar sands deposits and from Alaska’s North Slope, as well as from Angola. VLO bet big on heavy oil for a reason: The stuff is plentiful and hard to process. But VLO’s ace in the hole is their integration with the aluminum industry. Smelting new aluminum requires petroleum coke, a byproduct made by stripping the hydrogen out of the worst of the heavy oil and adding it to the lighter fractions of heavy oil, to make useful products like gasoline and plastics. Since Norway and Iceland have cheap hydroelectric power, aluminum smelting is done there on a large scale. Valero bought refineries in two Dutch Carribean colonies and expanded them, taking advantage of European Union trade rules to undercut other US petroleum coke makers, by shipping the byproduct duty-free to Norway. Quebec and British Columbia, which also produce a lot of hydropower and smelt a lot of aluminum, are accessible under the NAFTA treaty. If I were looking for a down-side on VLO, it would be if NAFTA talks break down and they’re no longer able to import Alberta tar and export oetroleum coke to Quebec and BC. Even so, the aluminum industry stands to benefit from high oil prices. Consumers have two ways to respond to $100/barrel oil. We can drive less, or we can buy cars that use less gasoline. Hybrid and electric car producers are including a lot of aluminum in cars’ frames, because aluminum is lighter than steel. Batteries are pricy, so making the rest of the car lighter, enables the same battery to give the car a longer range between charges. Gasoline powered cars, if made lighter by repacing some steel with aluminum, will of course use less gasoline. Valero;s management thought these issues through, in deciding to invest in making better use of heavy crudes. An end to the Saudi-Iranian price war over who can best supply China, is going to lead to a crude price increase, and that crude oil increase will only help to drive aluminum sales.